Up to this point, I have been focusing on the rbcX locus for all investigations of cyanobacterial photobionts because it is probably the most extensively sampled locus and it is more variable than 16S rDNA. However, it is limited because some groups of symbiotic cyanobacteria do not have rbcX sequences in the database. These include symbionts of the water fern Azolla which has traditionally been called Anabaena azolae and the photobionts of a variety of primarily tropical lichens that have traditionally been classified within the genus Scytonema. 16S sequences are available for both of these groups, as are sequences from a variety of other related genera of cyanobacteria. Furthermore, it is useful to compare the patterns revealed from analyses of rbcX to those based on an independent locus, often sampled from independent specimens. Unfortunately, my usual approach of identifying sequences using blast isn’t very practical for the 16S because there are (literally) millions of sequences in the database from metagenomic surveys. Since these environmental samples can generally include both free-living colonies and lichen fragments, they aren’t of much use for the questions that I’m interested in here. Instead, I made a list of relevant accession numbers culled from the literature. This includes both symbiotic and free-living strains, focused primarily on Nostoc, but including a representative sampling of other genera of heterocystous cyanobacteria, as well as some outgroup taxa. This list is far from exhaustive, and I intend to add additional sequences to it as I come across them in the literature. Currently, I’m including sequences from the these studies. 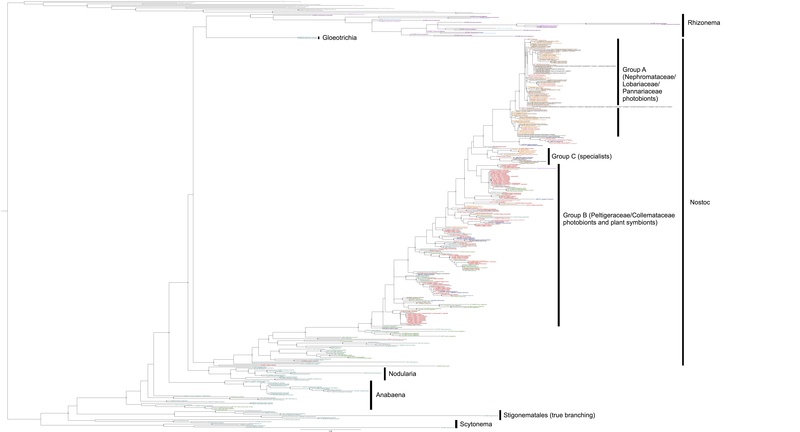 Cyanobacterial 16S phylogeny, coloured by host family (light purple: Stereocaulaceae, dark purple: Basidiolichens, dark brown: Geosiphon, light brown: Lobariaceae, red: Peltigeraceae, dark blue: Collemetaceae, light blue: Coccocarpiaceae, orange: Nephromataceae, pink: Pannariaceae, green: plant hosts, cyan: free-living). Names in black indicate genotypes found in more than one group.Grey indicates outgroups. Circles on internal nodes indicate aLRT ≥0.9. Members of the Stigonematales (heterocystous cyanobacteria with true branching) form a monophyletic group, but they are nested within the Nostocales (non-branching heterocystous cyanobacteria). Most of the Nostoc strains form a large monophyletic lineage, but there are a few strains identified as Nostoc that cluster with Anabaena. Anabaena is paraphyletic and includes strains identified as Aphanizomenon, Trichormus, Dolichospermum, and Cyclindrospermopsis. Nodularia and Scytonema each forms a discrete monophyletic group, though Anabaenopsis and Cyanospira strains group within the Nodularia clade. Lichen photobionts that have been described as members of Scytonema form an independent lineage, sister to Nostoc (along with Gloeotrichia). This novel exclusively lichenized lineage has been given the name Rhizonema. Symbionts of the water fern Azolla form a monophyletic lineage within one of the Anabaena clades, supporting the traditional classification and earlier phylogentic analyses. All other symbiotic strains cluster within Nostoc except for one symbiot of the flowering plant Gunnera which forms a distinct lineage along with three free-living Nostoc strains within Anabaena. There are also two symbiotic strains at the base of the Nostoc clade that branch earlier than a strain identified as Cylindrospermum, meaning either that an early branching Nostoc strain has been misidentified or that these represent an additional symbiotic lineage. Similar early-branching strains are also present in the rbcX phylogeny. Along with photobionts of the Basidiolichens Dictyonema and Acantholichen and the Peltigeralean lichen Coccocarpia, several Stereocaulon photobionts group within Rhizaria. I reported previously that rbcX sequences from Stereocaulon, as well as from Protopannaria formed a distinct lineage sister to all other Nostoc strains. I suspect that these sequences also represent members of Rhizaria. In contrast to the rbcX, where photobionts of members of the Lobariaceae, Nephromataceae and Pannariaceae (group A) formed a paraphyletic grade at the base of a clade composed of photobionts of members of the Peltigeraceae and the Collemataceae, as well as free-living strains and plant symbiont (group B), in this tree group B forms a paraphyletic grade basal to a well supported group A clade. As with the rbcX, Collemataceae photobionts are distinct from Peltigeraceae photobionts, though the sampling of Collematacerae photobionts is much less, so the pattern is not as apparent. There is a Peltigera malaceae/Nephroma arcticum/Sticta hypochra/Leptogium lichenoides clade (also including several photobionts of N. expallidum, another trimembered Nephroma species), though it is deeply nested within Nostoc, almost sister to group A (I’ll call this group of specialist photobionts group C). Photobionts of the flowering plant Gunnera magellanica form two distinct lineages within Nostoc, but in this case, there are 13 sequences from other species of Gunnera, none of which group with G. magellanica symbionts. Instead they form 7 other groups, three of which include symbionts of cycads or bryophytes. Symbionts of G. megellanica still stand out on long branches, but not as dramatically as they do for rbcX and symbionts of other Gunnera species do not appear to be on long branches. Overall, these results support previous findings in the literature regarding the distinctness of symbiots of Azolla and of “scytonemoid” lichen photobionts. They are also broadly consistent with my results for rbcX, except that the rooting is different within the main Nostoc lineage. In rbcX, the root connects to the “specialist” group C lineage, resulting in a paraphyletic group A. In the 16S, the root connects within group B, causing it to be paraphyletic. In the future, I hope to do a combined analysis of both genes to try to resolve this discrepancy. This entry was posted in Cyanobacterial photobionts and tagged Anabaena, Azolla, gunnera, Nostoc, Rhizonema, Scytonema. Bookmark the permalink. Hi there Heath! I’m using this info for a course I’m teaching on symbioses – today we’re talking about plant-cyanobacteria associations, and this page is super helpful. Thanks!